The developer tells the Council "We will not let you down." The Baltimore County Council last night gave the green light to the controversial $350 million Towson Row project. WYPR's Nathan Sterner and John Lee discussed how the vote went down. Sterner: The council was divided on this, right? Lee: The vote was right down party lines. The four Democrats voted for it. The three Republicans were against it. There were supporters and opponents alike in the audience watching the debate and the vote. What made this controversial is that the developer, Greenberg Gibbons, wanted $43 million in tax money up front to help jump start this project. Towson Row had stalled out under a previous developer. For a couple of years now the Towson Row site has been a fenced off eyesore in the heart of Towson. Economist Anirban Basu was hired by the county to study Towson Row. He said Baltimore County need look no further than to its neighbor, Baltimore City, to justify the investment in Towson Row. Basu said it would act as a defense mechanism against blight. Lee: I should point out Basu contributes The Morning Economic Report to WYPR. Sterner: Why did the three Republicans on the Council vote against it? Lee: They had questions about how long it would take for Towson Row to repay the tax money it’s getting from the county. They were given a range of 7 to 14 years. They have heard from constituents who want the money spent on projects that help communities, rather than a private developer. Councilman David Marks represents Towson and is one of the there Republicans who voted no. Marks had planned to call for a delay in last night’s vote, saying Towson Row was getting rushed through the Council. In the end, though, he said he did not have the votes to do that. His fellow Republican on the Council, Wade Kach, said there was pressure to get the vote done. Lee: County Executive Kevin Kamenetz, of course, is very happy with the Council’s vote. In a statement, he called it a great day for Baltimore County because the Towson Row project means 3,500 construction jobs and 2,000 permanent jobs. Once built, Towson Row will have a hotel, as well as student housing, stores, offices and apartments. The proponents say it will be transformational for Towson. And even Councilman Marks has said the same thing, that this will be transformational. But he objected to some of the details of the proposal and how quickly it got approved. Sterner: So what happens now? Lee: The developer, Greenberg Gibbons, wants to build the hotel and student housing first. Greenberg Gibbons got a lot of praise heaped on it from Council members, Republicans and Democrats alike, during the Towson Row debate. This is the same developer that built Foundry Row and Hunt Valley Towne Center. After the vote. Greenberg Gibbons Chairman and CEO Brian Gibbons promised the Council he will not let them down. Lee: Baltimore County Council members like to talk about the bipartisan atmosphere on the board. But it was nowhere to be found on this vote. The Democratic members backed the Towson Row proposal from the Democratic County Executive. It was opposed by the GOP minority. 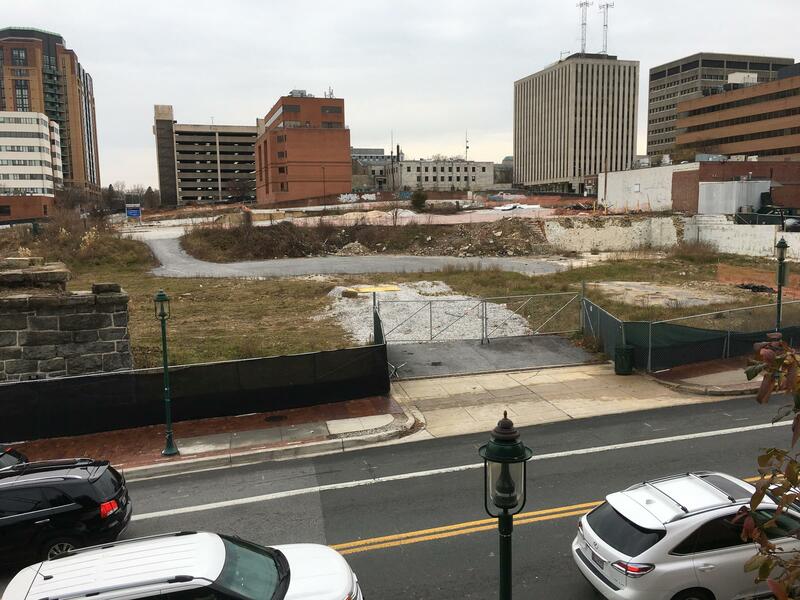 What to do with the big hole in the ground in Towson? A developer says he’s ready to move ahead with the delayed $350 million Towson Row project that would go on that property. But the developer and the County Council got blowback Tuesday from people who oppose plans to use taxpayers money to help get the project off the ground.